Wind power makes further inroads into the world’s electricity mix every year. It looks as though global wind power capacity will increase by another 44 184MW in 2012, and so raise global installed capacity to more than 281 GW. Growth in 2012 was driven by the United States, which chalked up a new installation record, and Europe, which remains a safe bet in the world market. The Asian market weakened a little but its potential for this year nonetheless looks bright. 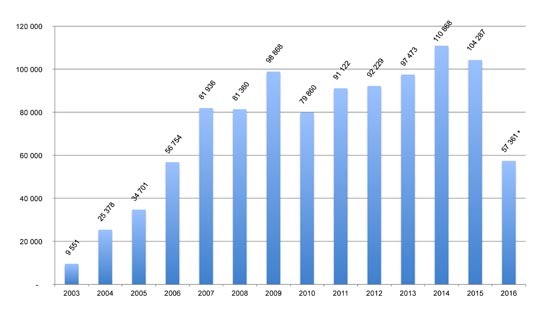 After the euphoria of 2011, the European Union’s photovoltaic market slowed right down in 2012. 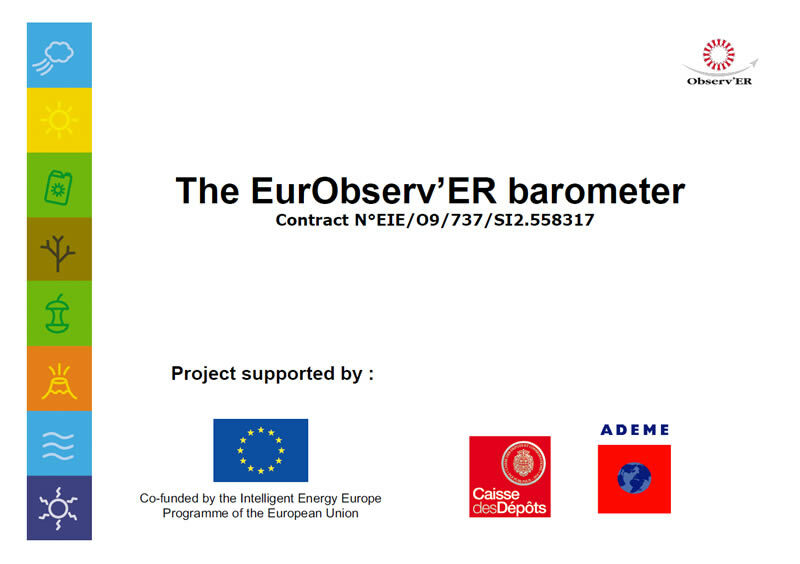 EurObserv’ER puts newly-connected capacity in 2012 at 16.5 GWp compared to 22 GWp in 2011, which is a 25% slide. At global level the market generally held up, with just over 30 GWp installed, bolstered by the build-up of the America and Asian markets. Plus qu’une vague, c’est une déferlante qui s’est abattue sur le marché mondial de l’électricité solaire, poussée par une forte demande des marchés asiatiques et américains. Le marché mondial du solaire photovoltaïque aurait dépassé les 76 GW en 2016, soit un pic de croissance de 50 %. Le marché européen obéit à une dynamique différente, seuls 6,1 GW supplémentaires ont été raccordés en 2016, soit une contraction par rapport aux 7,9 GW de 2015. Le secteur fait actuellement face à une réorganisation de son cadre réglementaire visant à intégrer davantage les énergies renouvelables électriques au marché. The European concentrated solar power plant market is steeling itself for tough time ahead. The number of projects under construction is a pittance compared with 2012 that was an excellent year for installations (an additional 802.5 MW of capacity recorded). This drop is the result of the moratorium on renewable energy power plants introduced by the Spanish government. The European solar thermal market is hardly any more encouraging. 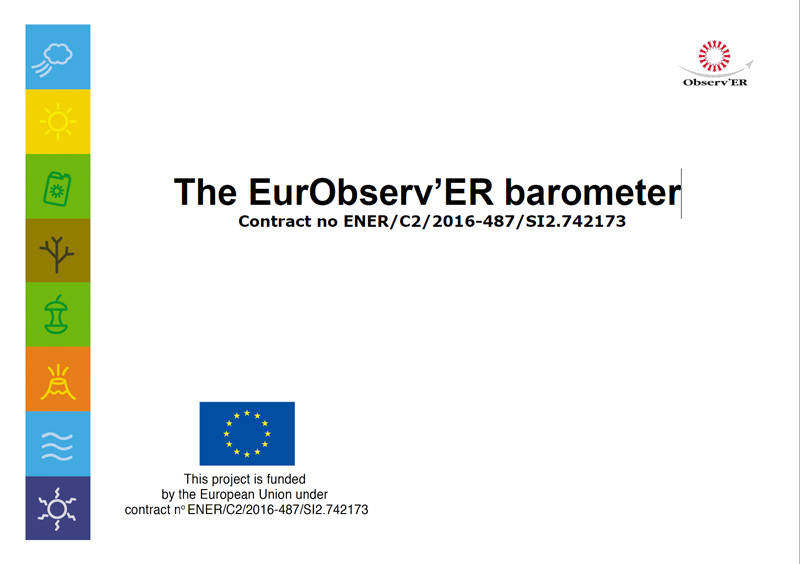 EurObserv’ER holds that it slipped for the fourth year in a row (it dropped 5.5% between 2011 and 2012). The newly-installed solar thermal collector surface area in the EU now stands at 3.4 million m2, far short of its 2008 installation record of 4.6 million m2. Despite the uncertain political context, biofuel consumption growth was firm in the European Union, rising to almost 14.4 million toe in 2012, i.e. a year-on-year increase of 0.4 million toe. However the previous years’ weaker growth trend is confirmed with growth at just 2.9% between 2011 and 2012. Demand on the European heat pump market has been a series of peaks and troughs since 2008 after several years of very strong growth. These fluctuations in annual sales affect the whole of Europe, and its individual countries. Sales have been hit by a blend of economic slowdown, financial uncertainties and low new construction figures. The 2012 trend pointed to further decline, because of tighter conditions in some of the key markets. The assessment made by EurObserv’ER of the air source and ground source HP market for domestic heating and cooling shows that sales decreased from 1.79 million units in 2011 to 1.65 million units in 2012, i.e. a 7.9% drop. Primary energy production from solid biomass is back on the road to growth, which according to EurObserv’ER stood at about 5.4% between 2011 and 2012. Output rose to 82.3 million tonnes of oil equivalent, which is a 4.2 Mtoe improvement on 2011, whose exceptionally mild winter put paid to the sector’s uninterrupted rise since 1999. This growth was enjoyed by all the solid biomass energy application sectors. Heat sales to heating networks increased 12.9% to 7.9 Mtoe in 2012 while electricity production, boosted by coal-fired power station conversions, gained 7.8% to produce 79.5 TWh. This publication provides a complete overview of ten renewable sectors, supplemented by two notes on concentrated solar power and ocean energy. 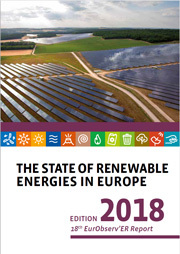 Additionally, for the fourth year running, the EurObserv’ER consortium members have published their annual renewable energy share estimates of overall final energy consumption for each Member State of the European Union. This issue also provides with the importance of the sectors in terms of employment and turnover. Finally, for the first time, a chapter dedicated to investment in RES sectors in Europe shows how the sectors are making their way through the economic crisis.